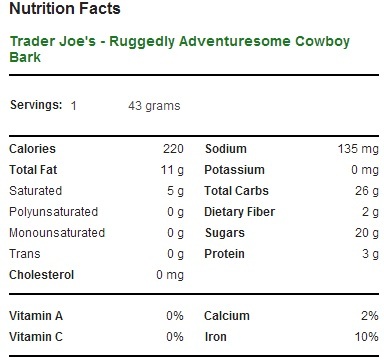 Well, we’ve seen some good names from Trader Joe’s before, but Trader Joe’s Ruggedly Adventuresome Cowboy Bark may take the cake for over-the-top product naming. Some marketer somewhere is recovering from a spraining their brain muscle after coming up with this one. Calling a pretty standard chocolate bark “cowboy bark” to begin with is already a wildly out of the box move – it’s not like there’s anything particularly “cowboy” about this chocolate bark in the first place. In fact, a decadent, dark chocolate treat sprinkled with cookies and toffee is one of the harder things to imagine a weather-beaten cowboy pulling out of his saddle bag on the range. Consider that, on top of this, they’ve added not just a self-aggrandizing adjective, but a totally unnecessary adverb as well and you’ve got my attention. I really wanted to like this chocolate bark -not just because I’ll seize any excuse to buy junk food again and again, but because almost nobody is tossing adverbs into their food titles anymore. Chunky Chicken Noodle Soup is a dime a dozen, but good luck finding a can of Superbly Chunked Chicken Noodle Soup. Who doesn’t feel for the poor, overlooked adverb, ignored step-child of the parts of speech family? Who doesn’t wish they encountered more deftly modified adjectives on their daily errands? I definitely do. So it’s got a good name – a crazy name, but a good one. It seems like we’re dealing with a shoe-in for next years best of list, right? After all, it’s dark chocolate with toffee, pretzels, Joe Joe’s Oreo Cookie knock-offs, peanuts, almonds and, to top it all off, a sprinkling of salt – what’s not to like? The problem, as you may perhaps have guessed, lays in the dark chocolate base. I’ve said it before, and I’ll say it again, but dark chocolate is not a confection to be tossed haphazardly into just any dish that you’d normally use milk chocolate in. Dark chocolate isn’t just some joke of a candy you can slather on whatever, dark chocolate is a high-yield plutonium warhead to be deployed only after considerable soul searching. Use it too frequently or in too great a quantity, and nothing else you add to it is going to matter. Case in point, despite the tantalizing selection of toppings included on the bark, you only taste two things – dark chocolate for days, and a hint of salt. 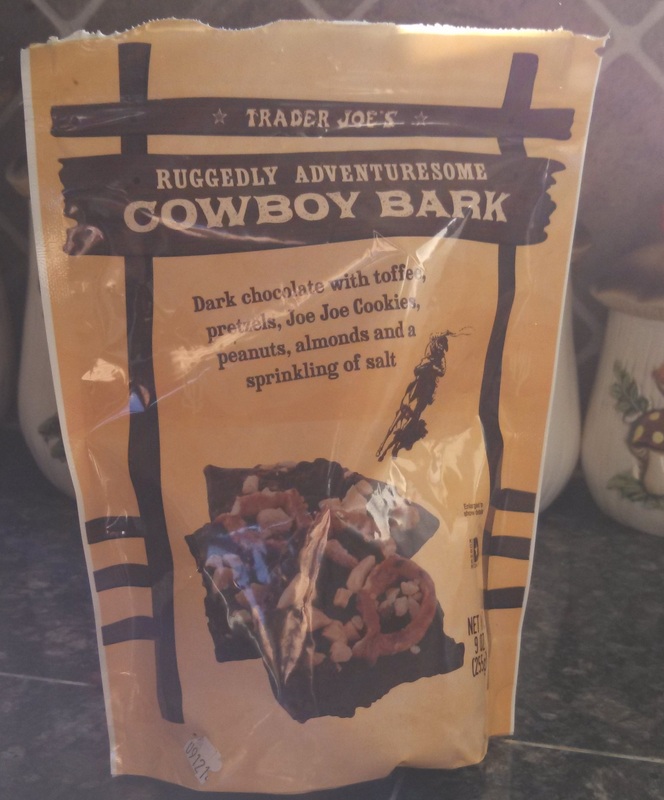 That’s certainly not bad – dark chocolate dusted with salt is a wonderful treat – but it makes the rest of the bark vanish into pointlessness. If Trader Joe’s was simply selling a bar of “dark chocolate with salty bits” I’d be singing it’s high praises – as it stands, there’s little reason to waste your calories on Oreo cookies and toffee you can’t taste. It’s a pretty good snack, but it’s not going to blow you away, and certainly isn’t worth the money when there are some many other amazing treats at TJ’s. Trader Joe’s, I’d love to see a milk chocolate version of this that lets the rest of the flavors shine through – until then, there’s no reason to come back. Would I Recommend It: It’s okay, but there are better buys out there. Would I Buy It Again: Not until there’s a milk chocolate version. Final Synopsis: A great idea, drowned out in too much dark chocolate. Wow. Talk about a ridiculously pedantic and nit-picky rant. Life is too short to care that much about what they name it (or how they went about it). And I disagree about its taste: I think it’s absolutely great, and I taste much more than just the chocolate and salt. From someone with discerning tastes in chocolate, I say they did a great job with this one. It’s a fun, rich, and delicious dessert snack! Furthermore, milk chocolate would have diminished the taste contrast that allows the flavor a certain level of distinction. If you found this review ridiculously pedantic and nit-picky, you should definitely checkout my Pumpkin Joe-Joe’s review. Put on a helmet though, because it might make your head explode. Dark chocolate and sea salt. Mmmmm. Have to agree with Tom. Review is silly. This stuff is just plain addictive! Guys, I refuse to back down on this one. The dark chocolate really overpowers the little snack bits. I think the Milk Chocolate Jumbles, or white chocolate Cowgirl Bark are much better! For those of us that don’t like milk chocolate because its just over sweetened, watered (creamed) down dark chocolate and hate white chocolate, this is good. I get so tired of all the milk chocolate choices, it’s good to see more dark (real) chocolate choices these days.